Fall is here. I'm going to miss the wonderful tomatoes, avocados, arugula, basil, and berries that filled my kitchen during those warmer months. But, I have to say, I welcome the fall produce. 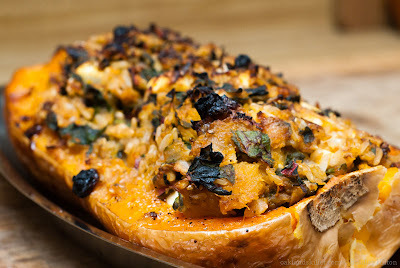 I love the hearty harvests of the fall; the greens, the root vegetables, and of course the squash. I think this recipe is quite representative of fall. 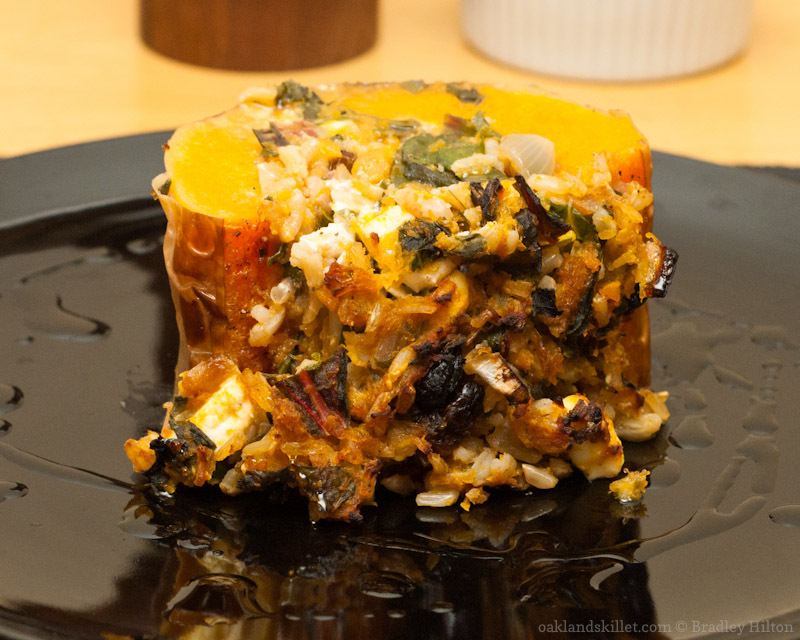 It's one of those dishes that helps stave off the damp chilly air that comes in with the fall here. This recipe is more or less my own creation, but it was inspired by something my sister once made for me. You'll notice that there is no salt in this recipe. Feta has plenty of salt and I love how the cheese doesn't really melt, so you get bites of salty varied with bites of sweet. The aroma and natural sweetness of the squash is enhanced by the cinnamon, nutmeg, and black pepper. This dish is all about bringing out the natural sweetness in these ingredients, but I'm not looking for a desert. 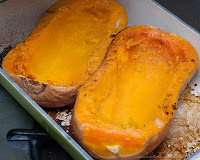 Cut the squash in half lengthwise and place in a baking dish cut side up. Season the squash with pepper and rub about a teaspoon of olive oil all over the cut side. Cover with foil and bake at 400 ºF for 30 minutes then remove the foil and bake for 15 - 30 minutes more or until the squash is soft but not mushy. Remove the squash from the oven and allow to cool for a few minutes. While the squash is cooling heat a saute pan or skillet over medium heat. Add the butter and olive oil to the hot pan. Saute the onions until the onions turn light brown. You want the onions to caramelize. While the onions are browning use a spoon to scoop out and reserve some of the flesh to make a dish out of the squash. Leave about 3/4 of an inch of flesh attached to the skin. Add the reserved squash to the onions. Then add the brown sugar, nutmeg, cinnamon, gram masala, and pepper to the pan. Saute for 3-4 minutes. Add the chard and cook until the chard is wilted. Add the cooked rice and rasins and saute for 1 minute more. Add the feta last and saute for 1-2 minutes. Stuff the squash halves with the squash and rice mixture. Make sure they are stuffed full, but don't pack them too tight. 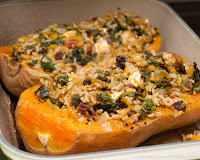 Return the stuffed squash halves to the oven and bake uncovered for 20-30 minutes more or until the top of the filling is browned slightly. Cut and serve with a drizzle of olive oil. This looks SOOO awesome! Thanks for sharing!